Come hear J.R. Martinez during No Barriers LIVE on Saturday, June 15th at 7:00pm! 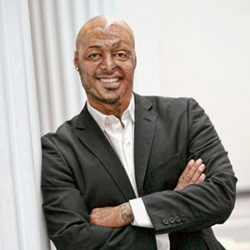 J.R. Martinez is an actor, best-selling author, motivational speaker, advocate, and wounded U.S. Army veteran. He is many things. But perhaps most significantly, he is an inspiration. J.R.’s career path has been incredible, and perhaps even a bit improbable. Once a high school football player from a small town in Georgia, the only son of a single working mother who emigrated from El Salvador, J.R.’s trajectory is nothing if not surprising. Even to him. After high school, he joined the army. J.R. was proud to serve, as a way to give something back to a country that had already given so much to him and to his family. In March of 2003, J.R. was deployed to Iraq. On April 5, he was driving a humvee in Karbala when his front left tire hit a roadside bomb. The three other soldiers were ejected from the burning vehicle, but J.R. was trapped inside. Having suffered smoke inhalation and severe burns to 34 percent of his body, J.R. was immediately evacuated to a local medic station in Iraq and then on to Landstuhl, Germany, for immediate care. He spent 34 months in recovery and had 34 different surgeries, including skin grafts and cosmetic surgery in the eleven years since his injury. During his recovery, a nurse asked him to speak to a burn patient, who had just seen his body for the first time and had become withdrawn. After a brief visit, J.R. realized he had a positive impact on this patient and decided to use his own experiences to help others. He continued to visit patients every day sharing his story and listening to theirs. He learned that inspiration is often a two-way street. Martinez now travels the world spreading his message of resilience and optimism. He devotes himself to showing others the true value of making the most of every situation. He has spoken to troops at various bases around the world, as well as to other groups including universities, non-profits, and Fortune 500 companies. His story is unique, but his message is universal: your path in life is decided by your own ability to adapt and overcome. However, many also know J.R. from his TV appearances. He’s starred and co-starred on a number of shows including daytime drama All My Children, action series SAF3, and Army Wives. In 2013, J.R. inspired a nation on ABC’s Dancing with the Stars when he and partner, Smirnoff, were named season champions. Martinez is the author of the New York Times best-selling book Full of Heart: My Story of Survival, Strength, and Spirit,” a memoir about how he was able to take his own personal tragedy, and turn it into an inspiration for others.